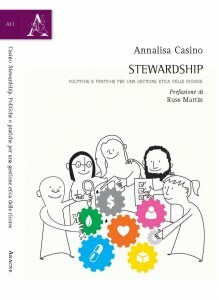 It gives us great pleasure to announce that Annalisa Casino, leader of GlobalPSC member Stewardship Italia, has just published a new book on stewardship. GlobalPSC CEO Russ Martin was invited to contribute the preface to the book. This volume is the first Italian text on the subject and explores the application of the concept of stewardship through an overview of its main areas of application: from product stewardship to the function of stewardship adopted by the World Health Organization, from the standards of paper and marine certification to antibiotic stewardship and management. The study also presents a case study of the experiences of stewardship in areas such as ethics / caring, relational ethics and social innovation of the professions. According to Annalisa, the “objective of this work is to reconstruct the history of a model that attempts to reconcile the differences between a corporate approach to an ethical, psychological, sociological and motivational approach”. Published in Italian, Stewardship, policies and practices for ethical management of resources is available here.